Once registered, users have access to many functions and tools that support evaluation and improve productivity. Website at www.MedicalAlgorithms.com; most of our registered clients prefer this user interface. Mobile - iOS app in the App Store for iPhones and iPads; same content as on the website; layout and navigation is adjusted to screen size. Android app in Google Play for smartphones and tablets; same content as on the website; layout and navigation is adjusted to screen size. API access for interoperability and bulk processing. See below Point 18 for more options of institutional users. SDK for developers with sufficient API calls to create a third party application. Operating the apps requires an internet connection. Inputs are not cached and the analytics and calculators do not work without an internet connection. Registration: registered users have access to selected functions and up to 100 calculations and documentations. Subscriptions(coming soon): subscribers have unlimited access to all calculators, documentation, and premium tools for personalization. Currently all registered users and have access to all content and personalization options. Institutional subscriptions from university libraries and institutions will provide full access to all their members. Screen and browse to identify suitable decision analytics by medical condition, keywords, references or ICD-10 codes. Algorithms with calculators are highlighted by a blue dot in front of the title. Analytics with only documentation and references do not have the blue dot. Select from our Packs on medical specialties and give you access to all analytics along the stages of diagnosis and treatment. Refine your initial search results by specialty and objective using the additional selections on the left of the screening results. Each calculator opens in a new tab so you can keep your search results. There are further options for storing your selected calculators as described in more detail below. As a professional in clinical evaluation and analysis, you can choose from our large number of medical calculators and clinical scores. However, it can only be your responsibility to select the right analytics to support you in the specific case under review. We assist you in this selection by providing several user-friendly searching and browsing options, as well as collections by specialty. Screening and browsing allows you to identify suitable decision analytics by medical condition, keywords, references or ICD-10 codes. You can select to screen all our 4,000 calculators or select to screen all 22,000 algorithm descriptions. Automated analytics show a blue dot in front of the title. Refine your initial search results by specialty and objective of the additional selections on the left of the listing. By specialty: our list of specialties and sub-specialties shows when clicking on the Specialty button. ICD-10 code: list of ICD-10 codes shows when clicking on the button. 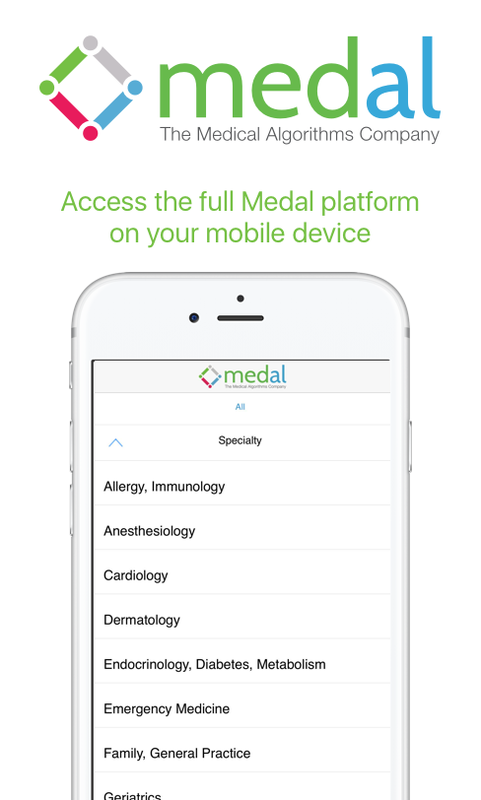 Medal Packs: Select from our Packs on medical specialties and give you access to all analytics along the stages of diagnosis and treatment. This is a systematically developed professional compilation to assist you with patient decisions for specific medical conditions. We are constantly adding new Specialty Packs to our platform. Guidelines: These provide analytics based on an official medical guideline of a medical/scientific society or workgroup and follows the medical workflow, from diagnosis to prognosis, treatment all the way to follow-up. Top Algorithms – on the second line of tabs at the top of the website you see the Top analytics used by our audience. Hovering over the name shows a brief description of the purpose. Title section: this is where you can see relevant information about the application and the condition under review. Evaluation section: here is the input data of the patient that is required to compute the results of the predictive algorithm. Inputs are restricted to realistic value ranges. If your inputs are extreme, you get a warning message. If your inputs are out of range, the calculation will not proceed. Results section: the screen moves automatically to the Results section when the evaluation is submitted and all inputs are correct. If the Results do not show, please check your inputs and observe the warning messages. Each algorithm includes a short description explaining its purpose. You execute an algorithm by entering your relevant evaluations into the data interface and submit it to obtain the results. Input values are range-checked and warning messages displayed if your inputs are outside realistic ranges. Calculators do not run if inputs are outside the defined range. The analytics require an internet connection. Data inputs are not cached. If you observe an issue on one of the analytics, we welcome your feedback. We will respond and fix any problems immediately. Interpretation and Description – this section provides you with background on the scientific studies behind the analytics. All studies and the original papers have been peer-reviewed. Our team of physicians and seasoned software engineers with healthcare experience have rigorously tested our calculators. If you observe an issue on one of the analytics, we welcome your feedback. We will respond and fix any problems immediately. Your individual needs: you can save the results, store the algorithm as a favorite, create individualized paths of series of analytics, print, email, save and forward any calculator to an email address or explore our suggested algorithms for additional evaluations of the situation under review. References and PubMed IDs – here you have all the references and a direct link to the abstract in the US National Library of Medicine at NCBI. ICD-10 codes – we show you the ICD-10 codes and a brief explanation for each calculator. Our Links tab gives you access to the CMS and WHO websites with detailed explanation of all ICD-9 and ICD-10 codes. Next Steps in Evaluation – you may be interested in additional analytics related to the specific calculator just used. The suggested analytics are categorized by clinical objective. These related calculators were selected by medical practitioners to suggest similar analytics that could be of interest for your evaluation. Hovering over the name shows you a brief description. Testing and Verification – We make every effort to provide high quality validated software and analytics. Reliability and usability are of great importance to us. We have taken particular care in developing, verifying, testing, and maintaining our calculators. We are following established policies for technical and medical review on all our analytics. My Likes – declare any algorithms as your favorite. My Saved* – save results from an evaluation with inputs and results. My Paths – define your own analytics workflow. Create your own assessment plan for any desired condition. Define different paths for different uses and update them individually. My Consult* – analysis, documentation and reporting of evaluation for individually identified cases. *Results and analytics are saved with identifiers of up to five characters. Character limits are in place to be in line with HIPAA privacy rules. Consult Tool – you can generate a report of your evaluation and for your evidence-based practice needs. Store all your reports with a 5-character identifier with date and time. You can access your evaluation with your original input data, continue the analysis and store it again. See theTutorial on top of the MyConsult table as well as a description of professional Benefits and applications. 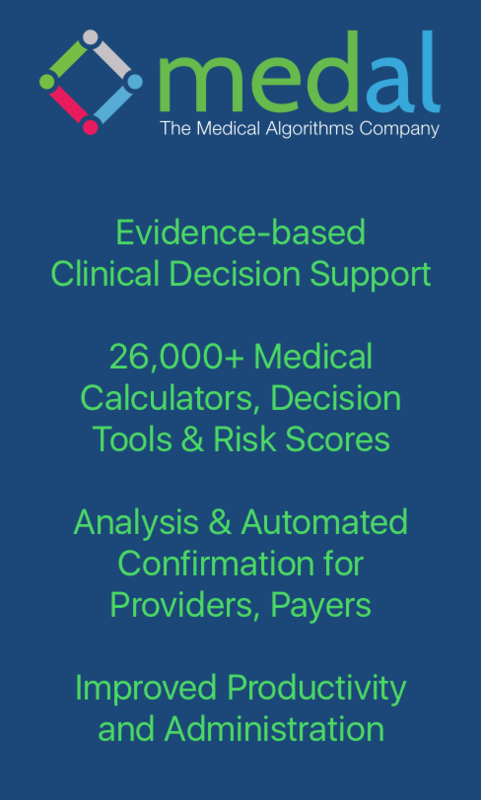 Accelerated Development – you can request accelerated development of a specific clinical decision analytic that shows documentation and references, but does not offer a calculator. We currently collect all requests and will add them to our development queue. We issue updated and reviewed versions several times a year, which usually contains new analytics. Blog: See our analytics in action: take a look at some practical use cases. Our Blogs (see the tab on the top menu) provides a large number of examples and uses of the analytics. Most blogs refer to a specific situation or need and illustrate calculator uses and evaluation options. Click on one of the blogs in the listing and you see a description of the case history and sample analytics to suggest algorithms to support your diagnosis, treatment or assessment of the case. You will find here many real life situations from practicing physicians. Clients: benefits and practical uses for various client groups are presented in the tab Clients on our top menu. We describe applications for decision support, quality care, automation options, and improvement of payment options. We also have links to sample algorithms which may help you as providers, payers, data companies, health administrators, pharma companies or telehealth providers. A converter for US and international measures helps you with converting any measures used in our calculators. The link is at the bottom of the webpage. Practical Links guide you to ICD code information and conversions (versions 9 and 10), cancer organizations, US and international organizations, as well as world and travel information. The link is at the bottom of the webpage. We provide access to all our calculators and models through our Application Programming Interface. You can integrate our analytics with your system by uploading your data and receiving the results back on your system. You can then use the results for further processing and integration with your data structures. Our up-to- date standard data definitions improve interoperability and efficiency. Integrate with your EMR/EHRs to evaluate a condition based on the data in the electronic health record. Bulk upload and processing of your data on our system; seamlessly execute our predictive models. Receive the results back as bulk download onto your system. Store your data on our separate HIPAA compliant platform. You can keep your data long term on our system. We offer analytics to provide you with statistical evaluations of your data and tailor the analysis and reports to your needs. Our tech-support team will assist you with implementation and data integration. We use standard data definitions for all our input values. We can assist you with matching your data items to the model input data items, and provide you with a data mapping structure. Contact us to discuss your requirements and data mapping formats (HL7, LOINC, FHIR). We offer to provide you with Consult Reports on any of the data sets you process through our API. Let us know whether you desire to add them to your patient records to support the evidence-based evaluation you have conducted with your patients. iFrame connection: We can set up a direct link directly on your website to any of our analytics. You can select the models you require, and your users can access and execute our calculators and models from your own website. Apervita.net– this third party platform using many of our calculators and models. It is a single access point to store and manage the data needs and analytics of enterprise users. We work closely with Apervita to verify and test all analytics. Usage monitoring and reporting for corporate users. We provide you with statistics on usage of algorithms. We will provide all custom analytics you require on your users. Support – send us a message and we will support you as quickly as possible. You can use the Support button at the bottom of the website to provide feedback or use the Contact button on the top menu to send us a message. Settings – here you can change all your personal information and access details. The Settings button is in the Welcome menu on the very top of the screen, next to your name when you have signed in. That menu also shows the link for Sign-Out.